We first spotted the strange bright feature colloquially known as "White Rock" in Mariner 9 images from 1972, and revisited it, without learning much more, in Viking images from the late 1970s. The subsequent decades were dark ones for Mars exploration. No spacecraft was launched to Mars between 1975 and 1988. That long launch hiatus was followed by a series of disasters. Two Russian missions launched in 1988 failed: Phobos 1 just two months after launch, and Phobos 2 two months after Mars arrival. Four years later, NASA's Mars Observer vanished just three days before it was to enter orbit. Three years after that, Russia's Mars 96 suffered a launch failure. Mars earned a reputation as the "Death Planet." 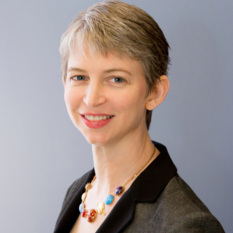 So it's impossible to exaggerate the sense of triumph and relief that accompanied the successful arrivals of Mars Pathfinder and Mars Global Surveyor in July and September 1997. Mars wasn't done punishing us humans -- Mars Global Surveyor was discovered to have a problem with one solar panel that caused a lengthy delay in the start of its primary science observations because it took much longer than originally planned to "aerobrake" into its mapping orbit. But that hardly mattered; we were thrilled by images of the Sojourner rover actually rolling across the Martian surface, distributed in near-real time via the new medium of the Internet, and we goggled at the incredible images from Mars Global Surveyor's modern digital camera system, so much sharper and containing vastly subtler details than the vidicon images from the Viking and Mariner missions. 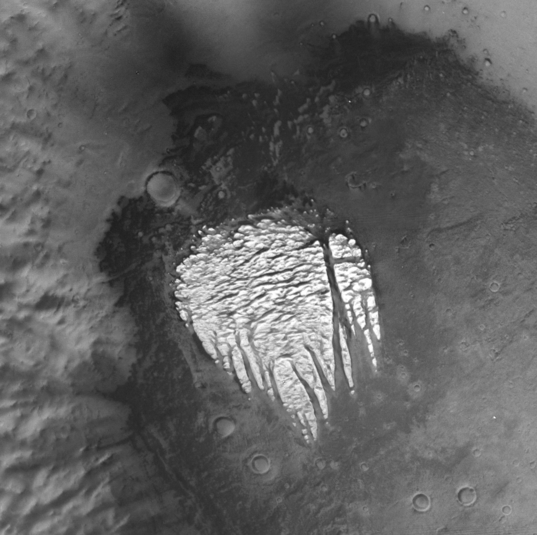 I entered grad school toward the end of Mars Global Surveyor's aerobraking period, and I remember that Mars scientists were still gaga over the detail visible in Mars Orbiter Camera (MOC) images. And no wonder. The sharp details in MOC images turned Mars from an enigmatic, alien world to an arrestingly Earth-like landscape, at least in some places. White Rock is an example of one of those places. I'll remind you of what it looked like to the Viking orbiters. Scientists could be forgiven for initially thinking that White Rock was actually an ice deposit. Here's what MOC saw, in a transect across the bottom center promontory. Dark material between the topographically high fingers of White Rock is now resolved into fields of dark sand ripples, marching neatly down the valley floors, intersecting in complexly patterned fields where wind evidently plays around the bright buttes. White Rock is made of some sort of massive material that seems to support steep slopes, judging from the sharp black shadows cast on the southeast edges of each separated rock. Some of the rocks appear layered in places. No impact craters are visible on White Rock itself, at least not in this view, but there are many in the dark sandy material. Some of the dark sand has blown into local little basins atop the white rock massif. This image is transformational. Although I can't say I understand White Rock's geologic origin from it, I can understand it as a place on Mars that I would need hiking boots to navigate; I'd trudge up a dune-filled valley and be relieved when my boot soles hit the White Rock formation. I'm sure that as soon as I reached that boundary, I'd have my nose to the rock, trying to focus on its constituent grains to determine what they might be, and what they might tell me about White Rock's history. Mars Global Surveyor captured this view of the enigmatic feature known as "White Rock" on September 6, 2000. Individual pixels are 2.86 meters across. It's really impossible to overemphasize the revolution in the understanding of physical processes on Mars that the incredible detail in MOC images afforded. In some areas, the extreme detail was almost a hindrance; Mars looked so different at resolutions of a few meters per pixel, compared to Viking resolution, that researchers couldn't even locate the skinny MOC frames exactly on the Martian surface. I picked White Rock as the topic for this exercise in part because it's pretty easy to match up high-res and low-res views. In the upper part of this image, a crater on the floor of Pollack crater underlies the White Rock deposit. This suggests that Pollack crater existed for some time before it was infilled with the material that formed White Rock, long enough for impact craters to form. Then the White Rock material was eroded again, exposing the ancient crater floor, which appears to be more resistant to erosion than the White Rock deposit. 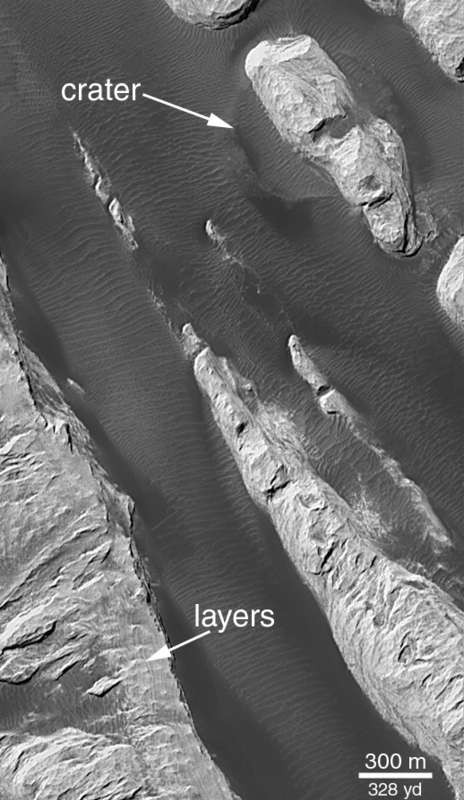 Lower in the image, parallel dark lines indicate layering in the White Rock material. The MOC team's interpretation of this history is that White Rock is sedimentary rock, deposited, perhaps, when Pollack crater was filled with water during some wetter period in Mars' past. But wait, there's more. 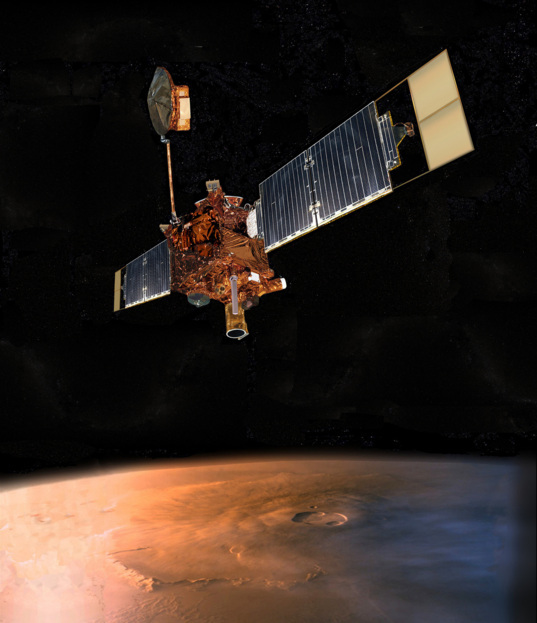 Mars Global Surveyor carried more than one instrument. As important as the MOC images were, the mission produced another data set that was at least as important: the first direct measurements of Mars' topography, from the Mars Orbiter Laser Altimeter. MOLA bounced a laser off the surface and waited for the return flash, firing shots ten times a second. Nowadays, most people use the MOLA data in the form of a global gridded topographic map. You can download these maps from the PDS Geosciences Node, and open them with NASAView. This image is cropped from the highest-resolution MOLA gridded topographic product, which has 128 pixels per degree (roughly 500 meters per pixel). In this view, high elevations are in white, transitioning through yellow, orange, and red to low elevations in black. The White Rock feature is visible as a small topographic high in the lower left quadrant of Pollack crater, which occupies the center of this map. Although the topography of White Rock deposits is locally steep, this map shows that it does not rise substantially above the crater floor. That's the best resolution you can get out of the global gridded topographic map. But along any individual orbital track, MOLA achieved much higher-resolution surface profiles. Thankfully, ASU makes these data easily available, at least wherever a profile coincides with a MOC image. Here's what the high-resolution MOLA profile looks like for the MOC image I showed above. The MOC image spans 20 kilometers in the along-track dimension. There are 64 MOLA shot points, so the shot-to-shot distance is approximately 300 meters. At left center, one shot lies in the center of a dune-filled valley at an elevation of about 870 meters, while another lies up on top of the White Rock deposit at an elevation of about 1020 meters, a difference in elevation of 150 meters. The toe of the White Rock cliff begins at about half the distance between the two shot points. Assuming the dark material is level (as it appears to be in the southern or right half of the image), that gives an elevation change of 155 meters over a baseline of 150 meters -- or a 45 degree slope, which is quite steep. The White Rock material must be well-cemented to support such steep slopes, which is to say that although it's not accurate to call it "white," it does appear to be accurate to call it "rock." Sort of. Mars Global Surveyor had another instrument, the Thermal Emission Spectrometer or TES. The first instrument of its kind sent to Mars, TES employed the thermal infrared portion of the electromagnetic spectrum to study the planet. Mars rotates just like Earth does, and its surfaces heat up when they are bathed in sunlight and cool down when they are shadowed on the night side of the planet. However, that heating and cooling happens at different rates depending on what the surface is made of. The largest influence on this rate of cooling -- described by scientists using a property called "thermal inertia" -- is whether the surface is largely bedrock or is mantled in dust. Dust is made of many many fine particles, which means dusty surfaces have high surface area, so they radiate the day's accumulated heat away quickly after sundown, and warm quickly upon sunrise. Bedrock, on the other hand, has much higher thermal inertia, taking longer to cool at night and heat in the day. Wiggles in the TES spectra could also be used to diagnose the presence or absence of certain minerals, though the low spatial resolution of the TES instrument -- individual pixels spanned areas about three by five kilometers in size -- tended to average out local compositional variations. In a paper published in the Journal of Geophysical Research by the TES team in 2001, lead author Steve Ruff had the following to say. The "White Rock" feature on Mars has long been viewed as a type example for a Martian playa [deposit of material from an evaporated lake] largely because of its apparent high albedo along with its location in a topographic basin (a crater). Data from the Mars Global Surveyor Thermal Emission Spectrometer (TES) demonstrates that White Rock is not anomalously bright relative to other Martian bright regions, reducing the significance of its albedo and weakening the analogy to terrestrial playas. I feel I should note here that close examination of Viking images had already proven that White Rock only appears anomalously bright because it's totally surrounded by anomalously dark material, the dark sand that makes those ripples. Its thermal inertia value indicates that it is not mantled by a layer of loose dust, nor is it bedrock. The thermal infrared spectrum of White Rock shows no obvious features of carbonates or sulfates and is, in fact, spectrally flat. Images from the Mars Orbiter Camera show that the White Rock massifs are consolidated enough to retain slopes and allow the passage of saltating grains over their surfaces [that is, sand dunes blow across them without disturbing their component materials]. Material appears to be shed from the massifs and concentrated at the crests of nearby bedforms. One explanation of these observations is that White Rock is an eroded accumulation of compacted or weakly cemented aeolian sediment. In other words, White Rock is not a sedimentary rock deposited in pooled water; it's a deep pile of windblown sand that was cemented, by some unknown mechanism, into a resistant rock. This conclusion was based on the absence of evidence, in the TES data, of minerals that form in evaporative environments, such as chlorides (salts), sulfates, and carbonates, and the argument that "there is no definitive observation that demonstrates what White Rock is. However, the ubiquity and abundance of aeolian sediments on Mars and the evidence that they can form indurated [cemented] deposits suggest that these may be the materials composing White Rock. In this scenario the unusual appearance of the White Rock feature results largely from its proximity to very dark material and its novel erosional form rather than its composition or mode of origin." Yet, as any scientist knows, the absence of evidence is not evidence of absence; the TES team conclusion, based mostly on the absence of strong water-related chemical signatures in the rock, failed to satisfy some Mars researchers. So, despite the order-of-magnitude improvement in image quality represented by MOC, and the return of two novel and unique data sets from the MOLA and TES teams, experts still disagreed about the origins of White Rock. Would the next generation of Mars orbiters be able to help resolve the disagreement?